When I was about 11 or 12 I bought the most hideous sequined blouse and found a million inappropriate ways to wear it. First with some baggy jeans, then with shorts and even with cargo pants. You see, back then everyone wasn't as accepting of sequins during the daytime as they are now. Even now, it blows my mind that I had the nerve to be that bold. While we can all learn from my mistakes, the fashion world and street style sweethearts have found a way to cement the idea of sequins and glitters as more than just for princess parties and Vegas show girls. They have found ways to incorporate it into their everyday wardrobes without looking ridiculously over the top. Even work wear has gotten a sparkly injection. In the spirit of remedying the horrendous mistakes I made when I was young and unwise I have decided to dedicate this post to giving all of us some tips and tricks to master the art of wearing sequins/sparkles/glitter at any time of the day or year. Try pairing your sequined items with masculine or tailored items to create a balance. For example, if you are wearing a sequined skirt, add a tailored blazer or a pair of brogues . 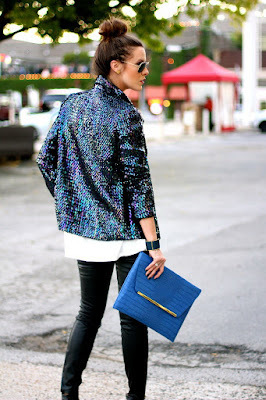 Sequins or sparkly pieces can be toned down by pairing it with simple fabrics, uncomplicated shapes and neutral colours. If you are not ready to go full on sparkly try introducing the trend into your wardrobe in small dosages. Accessories are a great way to do this. Because sequins and glitters are such statement makers you shouldn't pair them with anything that's equally over the top. Chose one item to be your focal and work around it. The rest of your look should compliment you sequins and not try to compete with it. How do you wear your sequined pieces? I would love to hear from you!